Can the BenQ G1 make its mark with this super slim camera which incoporates a tilt screen and bright f/1.8 aperture lens? Traditionally a low cost outfit, BenQ won't be the first brand that springs to mind for your next point-and-shoot digital camera. But first impressions of this 14 megapixel, all black Nikon S9300 lookalike aren't bad at all. While a little boxy in its design, the solid feel construction of the BenQ G1 doesn't immediately scream 'budget model', neither does the leather-look screw-on camera pouch unexpectedly provided with it. In fact it adds a touch of class. The BenQ G1's 4.6x optically stabilised zoom seems modest in this age of 21x zoom pocket cameras – a trade off for its relatively sender body – but it starts wider than most at an equivalent 24mm in 35mm camera terms. The camera also features a much brighter than average maximum f/1.8 lens aperture – something we're more used to seeing on premium cameras. This suggests better results without flash in lower light conditions, and the ability to attempt shallow depth of field effects, where the subjects pin sharp but background and foreground are attractively blurred. Indeed the camera also has an automatic 'background defocus' option built in. Perhaps the main talking point of this snapper however is the screen on the back, which can be tilted and swivelled. BenQ is claiming the G1 is the world's slimmest camera with such an attribute – although there is also the competing Samsung MV800, which offers a flip up, if not flip out, 3-inch screen. However the BenQ's identically sized LCD can be additionally swung out at 180°, so it is parallel to the body – pretty much like a palm camcorder – so for us offers more creative flexibility in a straight head to head. There is a price to pay for the above and in the case of the BenQ G1 that's currently a suggested £279. While not the outright bargain we might have come to expect from the brand, can it justify the cost in its handling and performance? The boxy rectangular body, about a third larger again than your credit card, means the BenQ G1 finds room for all the essentials. On the top plate we find stereo microphones, recessed power button, springy shutter release encircled by a lever for operating the zoom, plus a 10-option shooting mode dial tucked into the right hand corner. Though inevitably the aforementioned swivel screen dominates, the BenQ's back plate has room for a command dial in the top right hand edge, dedicated video record and playback buttons just beneath, plus a multi directional control pad. This can be used for tabbing through camera settings or stored pictures and videos as normal, or the scroll wheel that surrounds its edge can merely be spun for more rapid access. Near the base of the camera back are a tiny 'menu' button, a press of which reveals a clear list of options, though the lurid yellow in which these are highlighted is an eye dazzling choice. Next to the menu control sits an enigmatic 'Q' button. Though when you first switch the camera on a press of this achieves nothing, its purpose is revealed when drilling into the camera menu – in that a range of functions can be attributed to it. So, a press of the 'Q' button will provide a fast cut to changing ISO speed, to take one example. Again, customisable buttons weren't something we were expecting from the formerly cheap and cheerful BenQ brand. The flexibility of the BenQ G1's 3-inch, standard 4:3 aspect ratio back plate display is the real jewel in its crown. Yes, a high 920k-dot resolution is impressive, meaning that visibility-wise the G1 is a match for the best in its class, but being able to rotate the screen so it faces towards the camera body for added protection when in transit, or flip it to the left and rotate it so it is facing forward in the direction of the lens for easier self portraits with the camera held at arm's length is handy indeed. In short, we were able to achieve compositions that would have been awkward or impossible with a standard fixed screen – but we do feel you are paying a slight premium for the feature. The BenQ G1 comes with a SLB10 lithium ion rechargeable battery, USB cable plus USB-equipped mains plug – meaning there is no separate charger and the battery must be replenished within the camera itself. Not a big issue however, and the USB cable arrangement means the camera's battery can also be conveniently charged via your laptop or PC/Mac. This fact proved a godsend for us, as BenQ's people had neglected to provide a UK mains plug with our review sample. Battery life is good for 260 shots, which is just a little above average for a slim-bodied snapper. As well as the flexibility of its screen when it comes to lining up interesting angles for photos and videos, additional photographic control is provided by program, aperture, shutter priority and manual shooting modes – which allows both shutter speed and aperture to be controlled via the one LCD. Daylight photos taken in default auto or program mode are surprisingly clear and crisp, and offer bold yet realistic colours, thereby shunting aside our long held snobbery about the brand. Probably the most interesting of a handful of on-camera effect filter is a High Dynamic range 'art' mode that maintains foreground and background detail and boosts colour saturation for a hyper-realistic look. Processing is undertaken at the time the image is captured, and there's a six second wait while the camera does this. Others include a black and white sketch and oil painting effect, but sadly we don't get a subject-shrinking miniature mode. 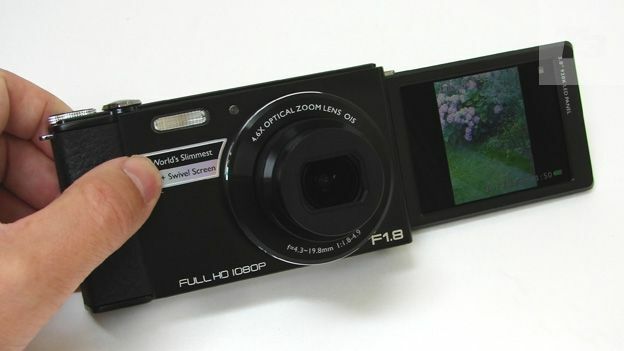 Another disappointment is that although the optical zoom can be used during video recording – filming commencing no matter which shooting mode is otherwise in play on the top dial – the mechanical buzz of its operation appears amplified on recordings. Wouldn't be a problem in a nosier environment, but under quieter conditions video sounds like there's a wasp trapped in the lens. Similarly, despite the ability to select a brighter than average aperture, photos are distinctly grainer above ISO1600 and at ISO6400 we're getting a watercolour effect as detail badly deteriorates. It may not be saying much in a world of stiff competition, but the BenQ G1 is probably the best digital camera we've seen from the brand to date. It features all the attributes we'd expect to find on a pocket snapshot in 2012 – one touch Full HD video recording, stereo sound, digital filter effects – and combines them with features we'd normally only expect to find on bridge cameras or premium compacts, such as its rotating LCD and bright f/1.8 lens. Shame then about the noisy zoom mechanism during video recording, which makes you think twice about using zoom at all when filming, yet the still image performance, higher ISOs aside, is better than expected from a simple point and shoot camera. Track down a more realistic price than the £279 being asked – at least £50 less we'd advise – and the BenQ, which we'd award three-and-a-half stars if our scoring system would allow, starts looking like it could be contender; if, that is, like us you're willing to put aside brand snobbery.